In the horse business, one is always looking for something unusual to send someone they do business with. 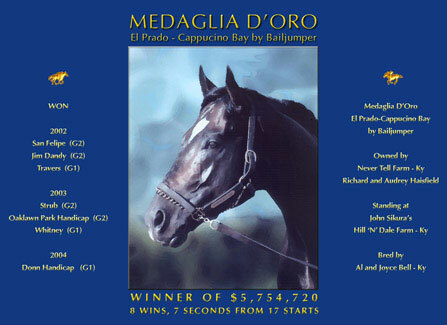 After purchasing Medaglia d'Oro, a great race stallion out of a mare we owned, Richard and Audrey Haisfield called us looking for another. We had a filly available, which they purchased and as an appreciation gift, we had Northwest Cellars design a custom label with Medaglia's picture and race record listed as well as breeders, owners etc. This was a unique gift unavailable anywhere else that they will enjoy sharing with their own customers. To top it off, the wine is excellent and one we plan on ordering again.